Updates on our latest and greatest jobs well done. We’ve all been through those neighborhoods where all of the garage doors look the same. We may even live in one of those neighborhoods! Although there’s nothing wrong with monotony, a little curb appeal never hurt anyone. Many people focus on flipping the inside of houses, but the outside is just as important. A new garage door could add a lot of curb appeal to your home. Complement the color scheme of your home for a cohesive look, or opt for bolder colors to make a statement. Add some windows and hardware to create the popular barn door look. The options are endless! Going hand-in-hand with curb appeal, the better looking your garage door is, the more likely you’ll be able to ask for a higher price when selling your home. Most prospective buyers decide their level of interest based on the house’s exterior. When your house looks good on the inside, it will draw prospective buyers inside. A garage door replacement is one of the top ways to increase home value, according to Remodeling magazine’s 2017 Cost vs. Value Report. An estimated 76.9% of new garage door installation project costs can be recouped upon the resale of a home. This makes replacing your garage door one of the top home improvement projects when it comes to overall return on investment. Upgrading your garage door can keep you safe in a couple of different of ways. For one, it could help prevent injuries, such as your garage door falling on you or your car. According to the Consumer Product Safety Commission (CPSC), there are 30 thousand injuries caused by garage doors every year. With an average weight of 400 lbs per door, it’s important to ensure the safety of you and your family! All garage doors manufactured after 1993 would have a built-in safety reversing mechanism, as well as automatic shut-off systems. That being said, if you have a garage door older than 1993, it’s time to upgrade! If your garage door is newer than 1993, you will want to make sure the safety systems are working properly. Some studies done by the CPSC has shown that even newer safety mechanisms have trouble detecting children. Either way, it’s best to make sure your garage door is safe. A huge trend amongst consumers these days is making sure the products you buy for your home are long-lasting and energy efficient. Because garage doors are the largest entry to the exterior of your home, it can lose the most amount of heat, creating a big problem for energy efficiency. To avoid this problem, make sure to get a garage door that has good insulation. Not only can insulation help with energy efficiency, but it also allows for quieter operation and increased overall door strength and durability. Going along with efficiency, if you invest in a new garage door with a higher R-value, you will save money on your heating bills. That’s because the R-value represents the ability to slow the transmission of heat. A higher R-value has a slower transmission of heat, which means less heat escaping your garage in the winter and less heat invading your garage in the summer. Therefore, when it comes to R-values for garage doors, the higher the better! In the Midwest, we see some extreme weather year round. You want to make sure that garage door can protect you and your belongings during times of inclement weather. If the garage door is insecure and becomes compromised, all of your belongings inside of the garage could be at risk to damage. If you have an attached garage, the inside of your home could also be at risk. When you get a new garage door, you’ll be surprised with how little you’ll have to do to maintain it. Metal garage doors are extremely low maintenance and won’t require much attention. Winterizing your door each Fall will be about all you’ll need to do to make sure everything is working properly. Nobody likes a noisy garage door! New doors with a higher R-value are quieter than doors that are not insulated. Polyurethane insulation also adheres to the walls of the door and is an excellent sound insulator. Often times, a new garage door will come with a new opener. High-tech features are now available with newer garage door opener models such as built-in wi-fi. This built in wi-fi allows users to have an app on their mobile device that controls the opener. If you forget to close your garage door, or you’re miles away and a friend or family member needs to get in without a code, you can easily open or close the garage door from you mobile device. You can also receive alerts when your garage door is opened or closed. Lastly, with new technologies available, securing your garage door is now easier than ever. You’ll be able to see when your garage door is open and closed, giving you peace of mind. In addition to constant monitoring, metal garage doors are much tougher for burglars to get into, making your belongings safer. With all of these reasons, a new garage door just makes sense! Spring is the perfect time to focus on updating the exterior of your home. At Barron Equipment & Overhead Doors, we carry the top lines of garage door models on the market! Stop by our showroom (on Brady Street in Davenport, across from Walnut Center) to see samples of the most popular models on the market. Our team of garage door experts will be able to assist you in finding the perfect garage door for your home. The time is now! See our full line of garage doors on our website. Why would a company out of Indiana hire a small company out of Iowa to install a modular office in their factory? One word–speed. International Paper out of Crawfordsville, Indiana needed a large project done in their factory in a very short amount of time. The plan was to take out an old conveyor, put in a new one, and install a modular office, all within 10 days. The contractor hired to do the job does quite a bit of work with our vendor, Porta-King. Porta-King is a company out of Missouri that manufactures portable buildings, shelters, wall partitions and mezzanines. A modular in-plant office was requested for this particular project and Dan Maras, a Midwest Regional Sales Manager for Porta-King, knew just who to call to install the modular office quickly and effectively. “We have done quite a bit of work with Barron in the past and we knew how fast they are with installing buildings and equipment,” said Dan. With a 10 day turnaround, this needed to be implemented as quickly as possible. Larry Venden, our Service Manager, loaded up supplies and 3 other guys and took a road trip out to Crawfordsville, about 4 hours from our home office. Within 2 days of arriving on the site, the modular building was complete. This particular building was unique with its application as a control room. The modular office was built on a raised platform with computer flooring to allow for electrical to get to the building. No matter when or where, our team is able to install equipment faster and more effectively than the competition. We are thankful to Porta-King for the opportunity to show that even though we’re a small, local, Iowa company, we can perform at a national level. Welcome to the Barron Blog! 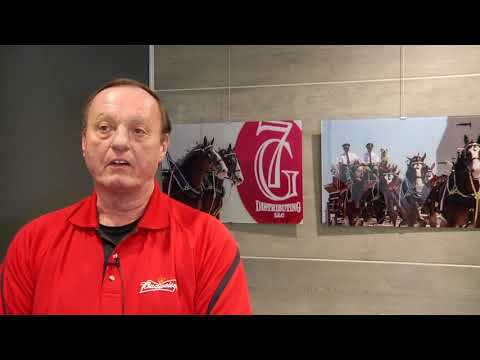 Check out our customer video with 7G Distributing! We provided all of their racking and shelving, truck and loading dock equipment, overhead doors, and guard rails. We enjoyed working with 7G in the initial building of their facility and we are pleased to continue to service their equipment with scheduled maintenance. We are thankful for a great partnership with them and we truly value our relationship with 7G, as we do with all of our customers! Listen to what Mike Brooks has to say about his experience working with us. Newly installed Gallery style doors! Your garage door can give your house a whole new look and we offer a wide variety that will fit your home perfectly. Would you look at that transformation. A new door can do wonders to the overall look of your garage. This is a WireCrafters Drivers Entry Cage. It is a perfect, cost-effective way to control building access, keep your facility safe and secure, and protect visitors. Typically these driver cages are furnished with a service window with a shelf for easy pick-up access and you are able to choose custom configurations to meet your facility’s needs. This is just one of the countless products offered.